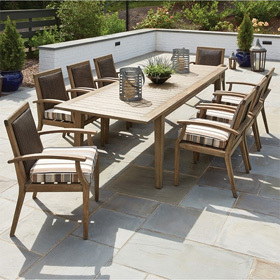 The Aris Swivel Counter stool will add a modern casual style to you patio with its subtle angles and vertical back slats. Designed to enhance upscale spaces, this contemporary outdoor swivel stool is an excellent match for OW Lee's aluminum counter tables. The stool is equipped with swiveling movement and includes the seat cushion for added comfort. Includes seat cushion with you choice of fabric.